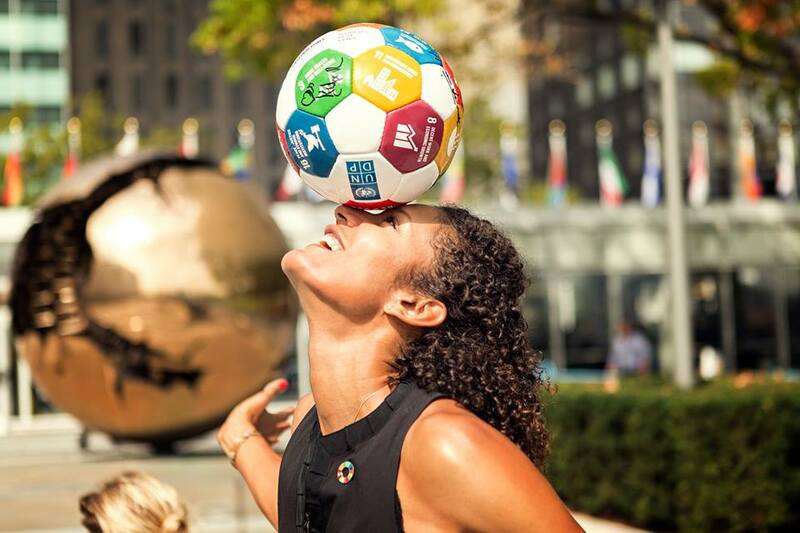 The unique Global Goals soccer ball not only proudly display the 17 Sustainable Development Goals, and as such are a great learning tool. It is also the only ball, which have been scientifically modified by scientists to fit women and young players. If you have any questions or want to buy more than 15 balls just write Majken at mmg@eirsoccer.com – and we will try to discount as much as we can and hope to be able to help locate sponsors who will buy balls and donate to everyone who helps take action. Many young girls and women are playing soccer with a men’s size soccer ball. Most other sports like basketball, golf, tennis, and hurdle race have adjusted equipment to give players the best chance to succeed. In soccer, players aged 14-19 suffer one serious injury per year. With a 90% chance of a suffering second injury, many of them retire from the game before they ever reach their prime. The Eir balls have been developed to fit women’s size and weight, to reduce injuries and enable a faster game. This is why we use them exclusively in our GGWCup Tournaments. We have created game balls for women since 2008 and they can last for years. Global Goals / SDG ball: Supports UN/UNDP and partners in spreading the 17 Global Goals. Do Democracy: Raises funds for a program that teaches players to use their voice. Art Rebel: Raises funds and awareness for RedCross Asylum United, the first women’s refugee soccer league. Girl Be Heard & Karma: An initiative supporting performances by girl refugees from Afghanistan and other war torn countries in cooperation with US State Department. Eir Black: Raised funds for an Afghan women’s and men’s national team bus. The UN Global Goals ball support UN spreading the knowledge about the Global Goals and supporting teams traveling to the Global Goals World Cups. The UN ball can be really helpful when coaching because all 17 goals are visual on the ball. This package includes 10 Global Goals balls and an optional free coaching guide call with one of our coaches. Just write to us here and select the ‘Request coaching guide call’ option. Remember that the Global Goals Impact Games platform covers free drills and games for all The Global Goals.